Your required Sales Associate Post-License course can be taken entirely online enabling you to complete this course at your convenience using a laptop, desktop or mobile device. Students are amazed at just how easy this course is to navigate and complete, even for students who have never taken an online course before. 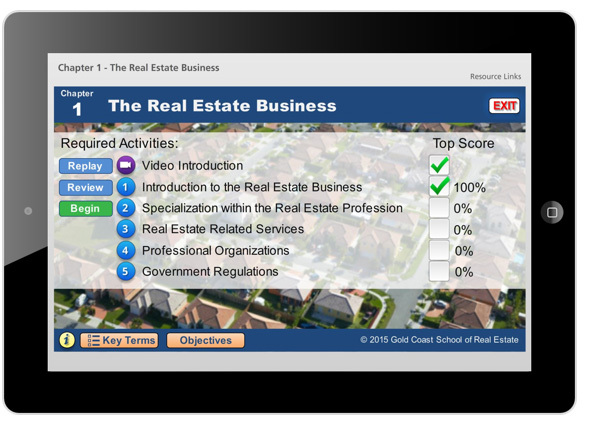 Learning is made easy through chapter videos that bring the classroom experience into your computer, interactive modules where you will learn by doing instead of being forced to read countless pages of information, and progress checks along the way. You also have technical support and access to a real estate instructor ready to answer questions over the phone Mon-Fri from 8:30am-5:00pm as well as by email. According to FREC rule, Sales Associates must complete 45 hours of Post-License education before their first renewal deadline. There is no grace period meaning that if you do not complete this requirement on time, your license becomes null and void. Don’t lose your license! Your tuition is valid for (1) one year giving you plenty of time to complete your course. The only timed portion of this course is the final exam which must be complete in one session and is given at the end of the material. Students must receive a 75% on this exam to receive a completion slip. If not successful in passing the exam, you will have immediate access to a second attempt after which you will be required to complete the course over again. Gold Coast will not charge any retake fees within your (1) year tuition period.